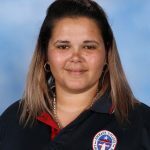 The aim of pastoral care for Aboriginal and Torres Strait Islander students is to acknowledge the uniqueness of individuals. Students are encouraged to embrace their Indigenous culture and share this knowledge while being fully involved in the school community. 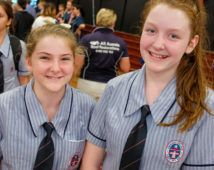 Acknowledgement of Country at school events is an important way to create a sense of belonging for these students. 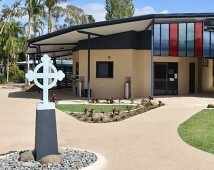 The Yaamba Road campus features a significantly cultural ‘Yarning Circle’. This special space is for our Indigenous students to meet as a group in addition to practicing their cultural activities. The Yarning Circle is a starting point for many College functions and maintains the strong links Emmaus shares with traditional owners. 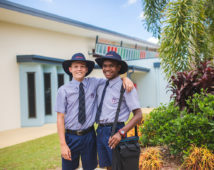 The Yaamba Road site is made even more significant in that it’s very name ‘Yaamba‘ means ‘home‘ in the Darumbal language. This year our Indigenous students have taught dance to various groups throughout the community. 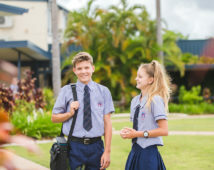 The students have visited Narnia Kindergarten as well as St Joseph’s Park Avenue, to teach the younger generation the significance of dance.